The Bonnies come into 2016 with an ultra-talented team, a favorable enough schedule to compete for the Atlantic 10 title and the return of A-10 coach of the year Mark Schmidt. Led by first-team conference guard Jaylen Adams and A-10 co-sixth man of the year Denzel Gregg, the Bonnies look poised to make a run, However, departures, injuries and academic suspensions have hurt the depth of the team. Now, Schmidt and company need the freshmen and the eligible transfers to step up in a big way. Dion Wright: The everyman of the St. Bonaventure basketball team, Wright acted as a sparkplug for every major statistical category for the Bonnies. Last year, Wright led the team in rebounds with 9.1 and finished 13th in conference scoring with 16.7 points per game (ppg). Wright did everything. Wright would never give up on a play and never quit no matter what happened in the game. He could do everything efficiently and take over games if Adams or Marcus Posley struggled, evidenced by his 32-point performance in the A-10 tournament loss to the Davidson Wildcats. The scariest thought though is who’s going to replace a renaissance man. Marcus Posley: MP3 will go down as one of the clutchest players in Bonnies basketball history. From his insane 47-point performance against Saint Joseph’s last year, to his buzzer beater against VCU his junior season, Posley has a knack for big performances. Last year, Posley locked in as the leading scorer for the Bonnies at 19.7 ppg, good for 2nd in the conference. But above all else, he could take over a game. If Adams, Gregg or Wright couldn’t hit a shot, Posley always came through with the big bucket. With him gone, someone will have to replace that consistency. The Rest: Both forwards Jordan Tyson and Derrick Woods decided to continue their basketball careers elsewhere. For Tyson, a combination of injury setbacks and playing time contributed to his departure among other factors. For Woods, it’s not clear what actually made him move on. One could infer he didn’t enjoy the split time with Tyson and with the addition of Syracuse transfer Chinonso Obokoh, the frontcourt may have started to become more crowded than expected. Still, neither player excelled and just acted as big bodies. Therefore, neither departure should affect the Bonnies too much barring injury. Chinonso Obokoh: Duh. The former 6-9 Syracuse forward comes to the Bonnies with one final year of eligibility. He comes at the perfect time as the Bonnies must replace three forwards, including Dion Wright. A former star basketball player out of renowned Bishop Kearney high school in Rochester, New York, Obokoh will look to start immediately. Despite a low amount of usage with the Orange, he showed in limited time that he could be a solid player. Expecting to be a starter last year, he lost his position to true freshman Tyler Lydon, who helped catapult Syracuse to the final four. Now, he gets to use his combination of size, touch and tenacity to show everyone why he was 2012’s 7th best center in New York. Matt Mobley: A volume scorer and solid shooter, junior guard Matt Mobley comes to the Bonnies after sitting out last season due to transfer eligibility. This may have been a blessing in disguise for the former Central Connecticut State stud. Now, Mobley gets to come into the starting lineup to replace the departed Posley and show off his scoring abilities with little restriction. At CCSU, Mobley vastly improved each year jumping from 6.8 ppg, 2.1 rebounds per game and 37% shooting his freshman year to 17.2 ppg, 2.8 (rpg), and a 40% shooting mark his sophomore year. Not to mention a 6% field goal percentage increase from his first to second year. If Mobley continues the trend, he should have no problem somewhat filling Posley’s shoes. The Rest: Maryland senior transfer David Andoh will look to get some solid minutes rotating with Gregg and Obokoh as the main three forwards. Andoh brings nice touch, a solid work ethic, a scrapper mentality and even a little shooting, all qualities the Bonnies need with Wright gone. Coaches have been raving about freshman Josh Ayeni’s abilities, energy and his rapid improvement. While he still shows a raw game, Ayeni shows flashes of greatness and if he can channel that ferociousness, can become an excellent player. Both freshmen Amadi Ikpeze and Tareq Coburn should see some minutes for the Bonnies as well. Coburn brings a silky shot and acceptable court awareness, while Ikpeze brings size and solid ball locating skills on rebounds. It’s all about the A-10 phenom Jaylen Adams. The junior guard ranked 2nd on our top 25 player preseason list and had many writers divided between himself and Jack Gibbs for the top overall conference player. If the Bonnies want to make the tournament this year — it’s on him. But it’s also on senior Denzel Gregg. He will officially transition from one of the top bench sparkplugs to a full-time starter. Gregg has steadily improved under Schmidt’s tutelage and could change the dynamic of the Bonnies if he can hit a couple shots from behind the arc. But maybe the most important returner is junior Idris Taqqee. Adams may be the star and Gregg the leader, but Taqqee dictates the defense and could become an extremely dangerous x-factor if he continues his scoring trend from last year. After coming in as a freshman struggling with his shot, Taqqee became automatic from the corner shooting 34% and averaging 5.1 ppg and 4.0 rpg with 25 steals and 11 blocks. Genuinely, the steps Taqqee has made are reminiscent of the aforementioned Dion Wright in terms of his ceiling. We all know what Wright was able to become. If Taqqee puts in the work, he can become the deadliest 3-and-D guy in the A-10, or maybe something more. St. Bonaventure came under fire last season for having a weak non-conference schedule. While that may be the case again this year, there are some solid tune-ups on this slate. A neutral site game against Florida will looks like St. Bonaventure’s toughest test, but a few mid-major opponents could give them problems. An away game against Hofstra could be a tough win for this St. Bonaventure team. The Bonnies will also participate in the round-robin Lone Star Showcase where they’ll face Little Rock, Central Michigan, and Pepperdine. Kenpom gives the Bonnies better than a 60% chance to win each of those contests. Also according to Kenpom, the highest ranked opponent St. Bonaventure faces in the non-conference besides Florida is UNC Wilmington, a team that played Duke tough in last year’s NCAA Tournament. 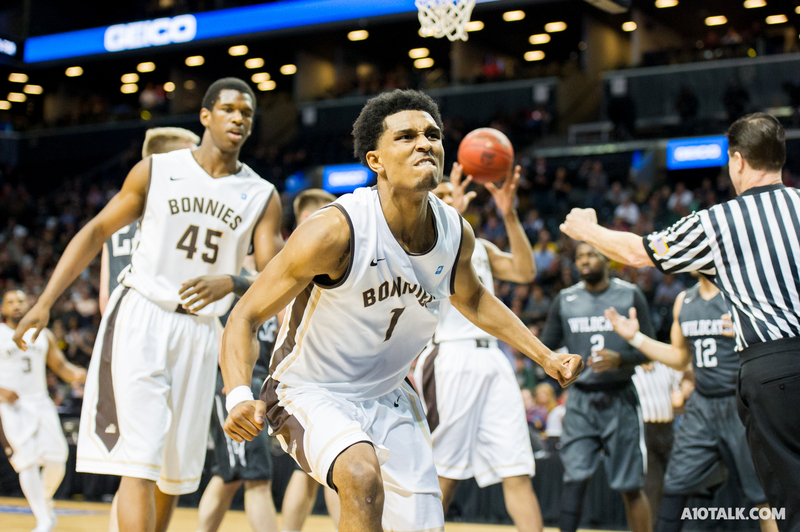 St. Bonaventure has a tough task trying to win a share of the regular season title once again. The Bonnies play Dayton twice this year and also face Davidson, George Washington, Richmond, and Rhode Island on the road. The Bonnies will certainly get their fair share of road tests this season. If they’re able to pull out a crucial win or two, they could have a shot at the NCAA Tournament this year. Winning games against the bottom-pack teams is key. If the Bonnies want to separate themselves from the middle in conference play, they can not afford to slip up against teams like Fordham, Duquesne or La Salle. Season Outlook: The Bonnies already took a couple hits with junior forward Courtney Stockard out for the second straight year, this time with a broken foot. They also lost projected backup sophomore point guard Nelson Kaputo for first nine games due to academic eligibility. But some positives have come to balance that out. Previously injured forward David Andoh was a full go at the Bonnies’ scrimmage against Alfred looking like he hadn’t lost a step. Both freshmen forwards Josh Ayeni and Amadi Ikpeze played well in the scrimmage. Ikpeze even led the team with six rebounds. It comes down to one player for the Bonnies. Jaylen Adams. If Adams can ascend to the ranks of the elite, the Bonnies have enough of a supporting cast to make the tournament. But, if Adams stays stagnant, it won’t be enough to force the NCAA to not snub them, unless Mobley’s averaging what he did at CCSU, Obokoh proves to be a star and Taqqee and Gregg make another huge leap. Still, this team can easily get 20 wins, maybe even more than last year. It’s a good time to be a Bonnie.